Page 3 of ‘I Have Decided’. This image shows Jesus performing his classic miracle of walking on water. This one was actually a little tricky to composite, as this was one of those images that required close reference to the Bible passage. However, Katy Hailes forgot to tell me this, and so I ended up drawing an image that was unlike what she had anticipated. But she went with it anyway after I made a few alterations. The Bible passage indicates this scene took place in early dawn, which she had told me about, and thus I was able to design the image in this way. But more importantly, it also describes Jesus performing the miracle in front of his followers on their boat. 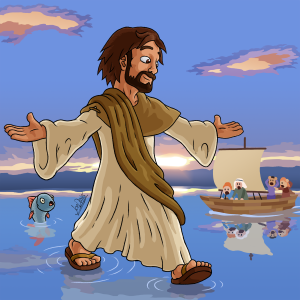 This is something I had drawn in the original image, as there was supposed to be a boat full of Jesus’ followers, in the right of the image, onlooking his miracle. But there was a problem. The passage indicated that Jesus was walking toward his followers as he was performing the miracle, which was not portrayed in the original image as I had not known this. The way I drew it was that Jesus was simply walking nearby the followers and not facing their direction, but that was not how the image was supposed to go down. I would have drawn an entirely different image to suit the passage, but to compensate for time and money, both me and Katy decided to settle on scrapping the boat full of followers entirely, and just show Jesus looking forward as he is performing the miracle. In the end, admittedly the image looks rather empty. But hopefully the text that will be added to the image later by Katy will take up the unused space. Oh yeah, I also added in a fish onlooking the miracle for comedic purposes. 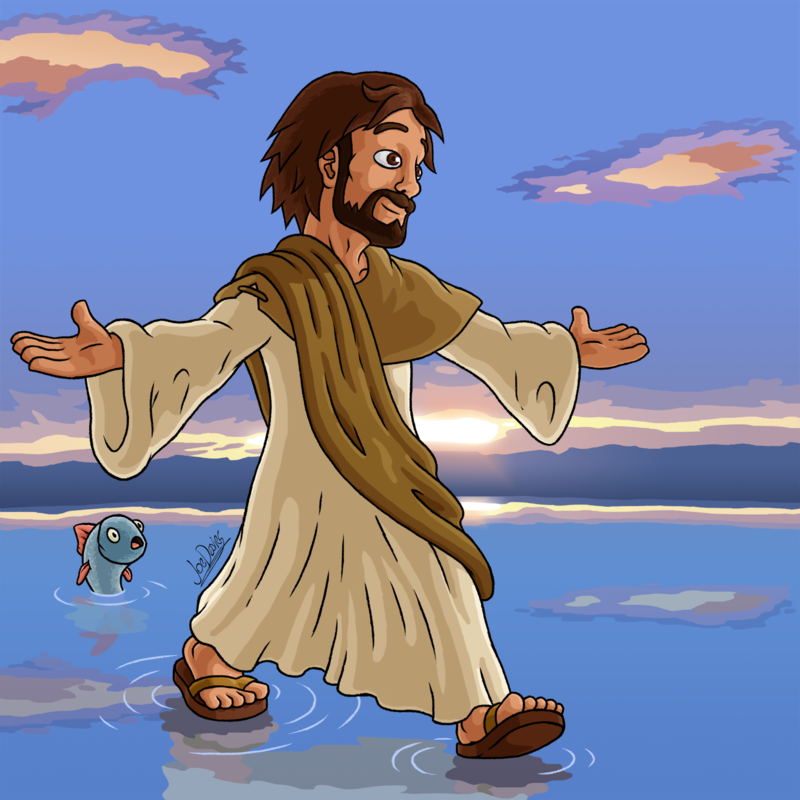 And also to properly show Jesus is walking on water.